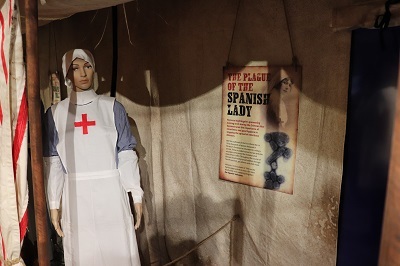 The Florence Nightingale Museum presents a special exhibition that explores the devastating impact of the Spanish flu pandemic 100 years ago, and the role of both professional nurses in military field hospitals and ordinary women at home, in caring for victims. Although overshadowed by the events of the First World War, the Spanish flu outbreak was a deadly influenza pandemic which struck in the autumn of 1918, just as World War I was drawing to a close. It is estimated that Spanish flu infected half a billion people worldwide and killed 50-100 million, significantly more than the war itself. The disease did not originate in Spain but because the country was neutral in the first world war, there was not a political clampdown on news concerning the disease. It was estimated that a quarter of the British population fell ill with Spanish flu at some point during the pandemic and about 250,000 people died. 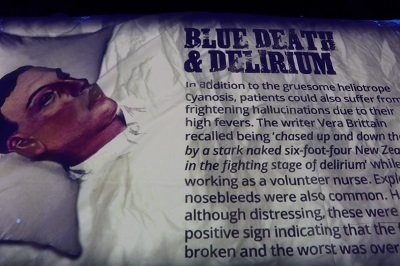 The more serious strain of the influenza was unusual because healthy young adults seemed to be particularly at risk and it created gruesome symptoms, including explosive nosebleeds and distinctive blue tinged skin caused by a lack of oxygen as their lungs filled with fluid and pus. 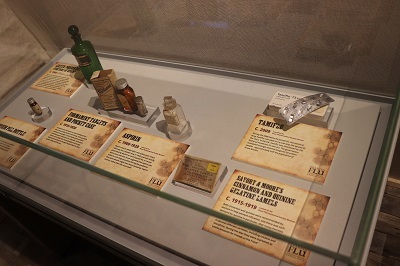 People became desperate and would try many alleged ‘remedies’, the exhibition includes some of these including Quinine tablets, Aspirin, Opium , Boots Eau De Cologne. Oxo and a Creosote Vaporiser. 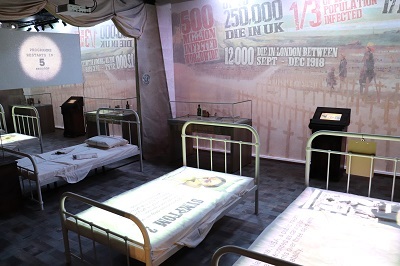 The exhibition also includes an experimental Influenza Vaccine developed by the Royal Army Medical College which was used in a desperate attempt to combat the virus. Such was the speed of the pandemic and with resources stretched already by the war, essential public services began to break down with hospitals being overwhelmed with patients, and a shortage of both coffins and gravediggers meant that the bodies of victims could remain unburied for weeks. A mourning card in the exhibition relates to four children from the Baker family in Nottinghamshire who all died of influenza within the space of two weeks in 1918. A short animated film based on the notes of Dr Basil Hood from the St Marylebone Infirmary in this period gives some insights into the problems faced. A number of nurses died in this period in the hospital which increased the difficulties of dealing with large numbers of patients. 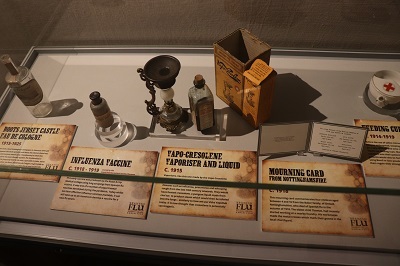 The exhibition explores the often neglected role of the professional nurses and ordinary women who cared for the victims in the pandemic, Florence Nightingale’s pioneering nursing work during the Crimean War revolutionised the way nurses were viewed within society. With the outbreak of World War I, thousands of women were inspired to follow in her footsteps and volunteer as nurses. It was these women that would be vital in the treatment of casualties in the war and the victims of the Spanish flu in 1918. 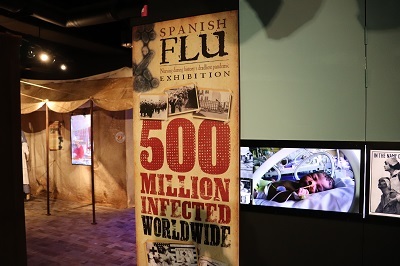 This fascinating small exhibition highlights some of the aspects of the Spanish flu pandemic from 100 years ago that have largely been overlooked. Even though more people died from the pandemic than were killed in the war, it was the war that grabbed all the headlines and would be honoured in ceremonies. This particular strain of flu which is similar to ‘Avian’ flu strains was poorly understood and medicines had not been developed to deal with this kind of breakout. 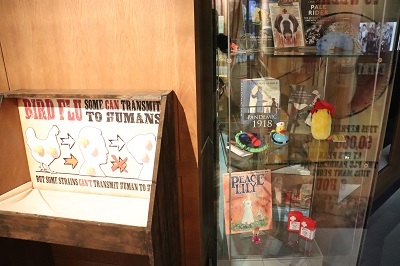 The exhibition includes some Tamiflu capsules that were used in the 2009 Swine flu pandemic, health organisations around the world stockpiled millions of these drugs to deal with any outbreak. The end of the war led to millions of soldiers travelling across Europe and beyond which allowed the transmission of the disease to be quicker than normally would be the case. 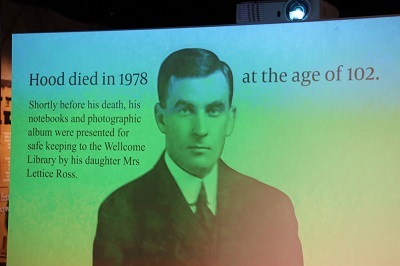 There were cases of soldiers who had survived the horrors of the war returning home to find their wife and children had died from the pandemic. 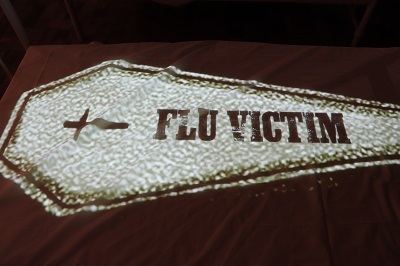 The extreme forms of the ‘flu’ led to a rise in suicides and psychological breakdowns illustrating the enormous mental strain of dealing with the pandemic. 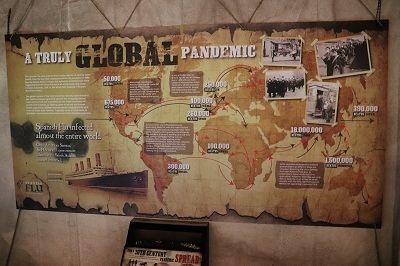 This exhibition and the many other events that mark the centenary of the Spanish flu pandemic provide important information about how pandemic outbreaks can develop and have catastrophic consequences. It seems remarkable that the many victims of the pandemic have often been forgotten in contrast to the war dead, there are few if any memorials or plaques that remembers the Spanish flu pandemic of 1918 despite the massive loss of life. By londonvisitors2014 in Exhibitions on September 20, 2018 .